The Intelligence Module provides additional functionality and resources for an investigator. The module focuses on Social Media Intelligence (SocMint) and Open Source Intelligence (OSINT). 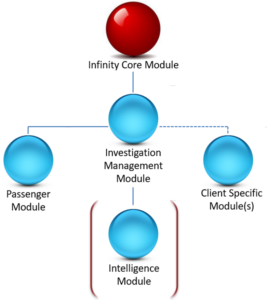 The Intelligence Module can be expanded based on the Clients requirements. The capture and index feature of the Intelligence Module adds real value for investigators. Information derived from SocMint or OSINT sources can be extremely volatile and can be removed quickly and easily by their owners with little or no trace remaining. The ability to capture this volatile data and associate the data with a target, before it is removed from the external data source, could be critical in driving the direction of an investigation or securing a successful prosecution. Within Infinity, social media sources can be searched. A target’s profile may be examined and the details captured. These social media details (profiles, posts, connections etc.) may then be saved and linked to a target. This is achieved natively within Infinity. An Investigator can run web searches directly from Infinity. The benefit of running a web search query in Infinity is the ability to capture the results and associate them with a target. Infinity currently supports Google’s search engine. An Investigator can search maps directly from Infinity. Maps can be captured and associated with Targets or Investigations. Maps can be useful in identifying locations where targets have been or validating addresses targets have supplied. Infinity currently supports Google maps. The Most Wanted Search is a feature that allows the user to search for the target against most wanted lists provided by law enforcement agencies. This is a web search using the search forms provided by the individual law enforcement agencies.